This issue was not considered to be a security issue based on “Definition of a Security Vulnerability” in https://msdn.microsoft.com/en-us/library/cc751383.aspx as I have been told by Microsoft MSRC team. I thought it can be interesting to some people, so I am sharing the details here. It seems Microsoft Word and Outlook applications (tested on Office 2010) analyse the DTD section of an XML message upon pasting it in a document or a new email. This can lead to a denial of service attack by creating an XML message with a large number of nested entities. The victim should paste the crafted XML message into a Word or Outlook document in order for this issue to be exploited. This can potentially be done by using websites that put arbitrary data in the clipboard upon clicking a button or pressing the CTRL+C combination. 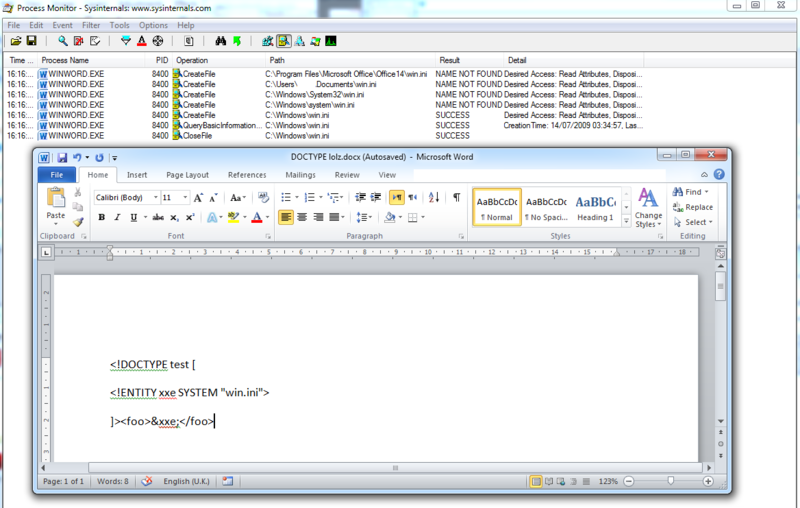 The following image shows that MS Word has sent some requests to the file-system to find this file. It was not possible to use this vulnerability to send requests externally or use arbitrary files on the file system which are outside of the PATH (in environment variables). Therefore, I could not exploit it to hijack files as I could not use the “/”, “\”, or “:” characters. This entry was posted in Normal Posts, Security Posts on March 31, 2015 by Soroush Dalili.